Take wine and wildlife to your next party or bbq with these stunning wine glass charms and you’ll never have to worry about losing your wine glass again. 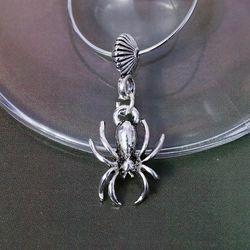 Let this small spider help protect your wine from being carried away accidentally at your next party or bbq, or simply show your love of The Land Down Unders amazing array of arachnids. 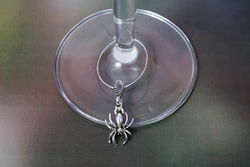 The charm is 13mm L x 3mm W x 18mm H. This small spider is made from Tibetan silver and made into this beautiful wine glass charm here in Australia. There are over 2400 species of spider in Australia and they vary in sizes, species and colours. Some look like they are encrusted with jewels from their colours and markings. Spiders play a very important role in the natural world, they are one of the greatest natural forms of insect pest control. Could you imagine what your next outdoor picnic or bbq would be like without spiders if they weren’t here to do their important role of pest control?